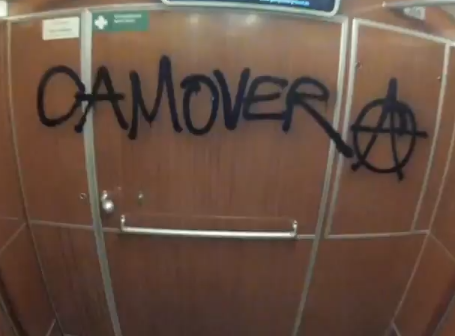 In the “fight” against video surveillance, a new type of real-world game was recently invented in Berlin/Germany: Camover. And the rules are quite straight forward: Destroying as many video surveillance cameras as possible, filming the act and uploading it to YouTube. While not required, it is recommended to conceal your identity while filming. The game ends on 19 February; the day the 16th European Police Congress starts in Berlin (Anonymous Austria initiated a similar operation recently as well). One might think of this game as a valid method to fight suppression, surveillance and intrusion into our privacy. However, I think it should be seen as what it is: Pure vandalism, which will not change a thing. The cameras will be replaced with new, state-of-the-art megapixel cameras. In the end, it is we, the tax payers, who will have to pay for the damage done. Video surveillance in public is not necessarily a bad thing, especially if we look at some recent “success stories” in Austria, where crimes were solved using video surveillance. And I know of not one case, where video surveillance in the public has been abused (yet). Having said that, making sure that abuse is not possible and that our right to privacy is not tampered with, is a main concern of mine. This can for example be achieved by creating feasible laws and by new technology, which has been built with privacy by design in mind. But destroying cameras is definitely no solution.